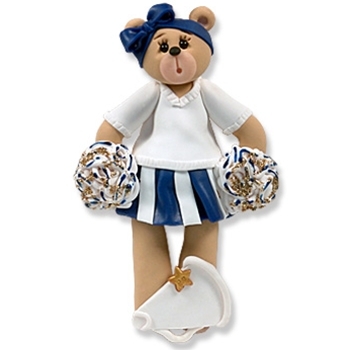 This charming little Belly Bear Cheerleader, is ready to lead her team to victory! She is one of our sports ornaments and is beautifully detailed with just the right amount of sparkle on her pom-poms. This ornament may be personalized on the megaphone and on the sweater. This is a great personalized Christmas ornament for any cheerleader on your list.